Gratitude, A Guest Post, and a Giveaway! that we always are enough? Kathy is the real deal - a kind-hearted soul exploring the world and sharing her stories with the rest of us. This week is Gratitude week at Bliss Habits and I am thrilled to be able to add my voice to the discussion. Filled with gratitude? Ready to take the next step? Just looking for the giveaway? the larger kind we feel for what we give. I invite you to take the next step beyond reading these words. I invite you into experience. Practices like gratitude journals or thanking those with whom you interact can be beneficial. But in the spirit of oneness, I invite you to experience the gratitude of another. The next step? Do something for someone else that might make them feel grateful. We’re not getting attached to the outcome here, so if they don’t express thanks – don’t worry about it! You are simply offering an invitation to experience gratitude. This can be a small act or a large one. Offer a dollar to a child in a store. Invite someone into a discussion and truly listen – offer them the opportunity to be seen and heard. Hide a favorite quote in a library book for the next patron. The possibilities are endless. Share what you did in the comments section of this post. Read what others have done. Celebrate the kindness that is being spread in the world and the possible experiences of gratitude that are being lived. 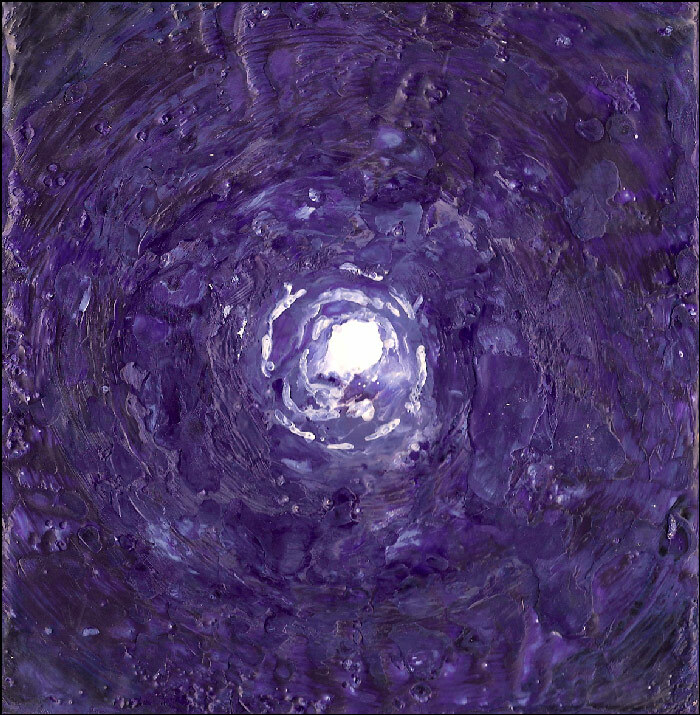 The winner will receive a 6x6 print of my recent encaustic work, Gratitude. Gratitude is a reminder of the radiant peace that is at our core. Even in swirling confusion, even amidst tremendous fear of not having or being enough, even at the bottom of this seemingly endless pit of "not enough" is that peaceful light. When we strengthen our awareness of that center of being, we become free to make choices that reflect that nature.